Nearly twenty five years ago, the grounds and buildings of Capon Springs were dedicated as a historic district in the National Register of Historic Places. The district includes the entire main grounds on both sides of the road from the water house up to the spring house. 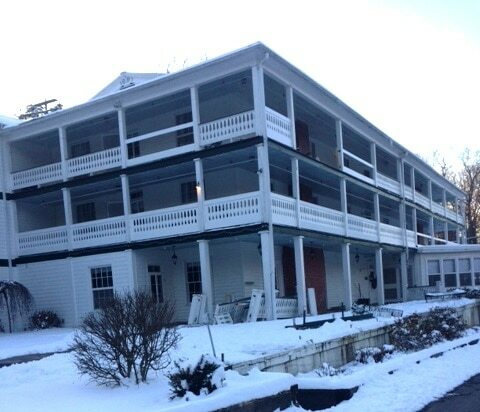 Capon is one of the few functioning 19th century spas with most of the original buildings still in use. We know that for many of you, it is the timelessness of Capon that is so special to you and your families, and we agree! As the years go by, we find the costs of keeping our historic buildings in timeless, excellent condition continue to rise. Therefore, in order to continue this legacy for new generations, we are creating a Historic Preservation Fund in 2019, separate from basic operational income and expenses. This fund will be dedicated to repairs and careful renovations of Capon’s buildings to preserve their historical features and allow for continued safe, comfortable, cost-effective, and energy efficient use. As a part of this effort, we are joining other historic resorts in adding a 5% Historic Preservation Fee to the basic room & board charges. This fee will be devoted exclusively to the upkeep and maintenance of the historical property, including the rooms themselves. We will be keeping you up to date on the progress of these projects in future emails and in photo displays at Capon. We will also be investigating other ways to support these efforts, including donations to the fund, grants and tax credits. Our goal is to make sure Capon’s buildings can continue making memories as your home away from home. We value your presence, your love, your friendship, and your feedback. Thanks for helping keep Capon, Capon!